In our series, Game Changer, we’re highlighting products that are so good, they are having a significant effect on our beauty routines. Maybe it’s because of my line of work, but I admit: I was once addicted to the Clarisonic. Never does your face feel so clean after a good polish using a cleansing brush. But unless your skin is oil-prone, it’s not gentle enough to use daily—and I was using it twice daily on dry sensitive skin. For weekly exfoliation, the Clarisonic is your man. 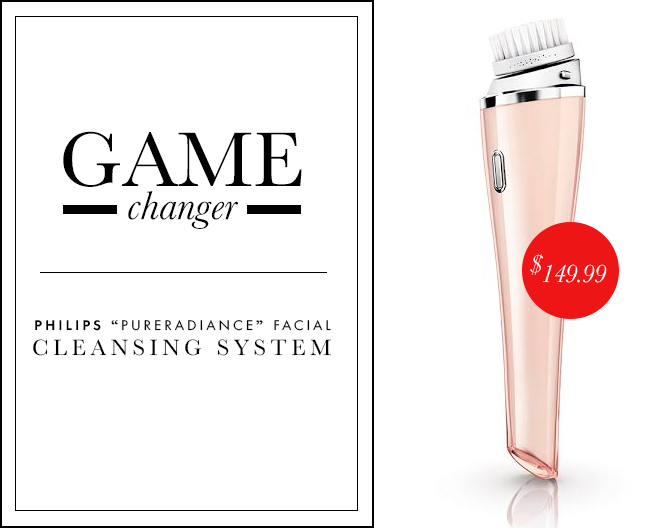 For twice daily cleansing and light exfoliation, Philips PureRadiance Facial Cleansing System ($149.99, usa.philips.com) is the new go-to. The brush bristles are so soft they can even be used to remove eye makeup and stimulate blood flow underneath the eyes; camouflaging tired eyes has never been easier. The system’s dual-motion technology—it pulses and rotates in circles—helps to break up dirt and dead skin cells while sweeping it away from the face simultaneously. The system has a timer similar to the Clarisonic, but unlike the Clarisonic, it pulses every 20 seconds. This gives you one minute to reach the three key areas of the face—avoiding over-cleansing any one area. After just a week of use, my skin was smoother, brighter, and even with the increase in exfoliation, more hydrated than ever.